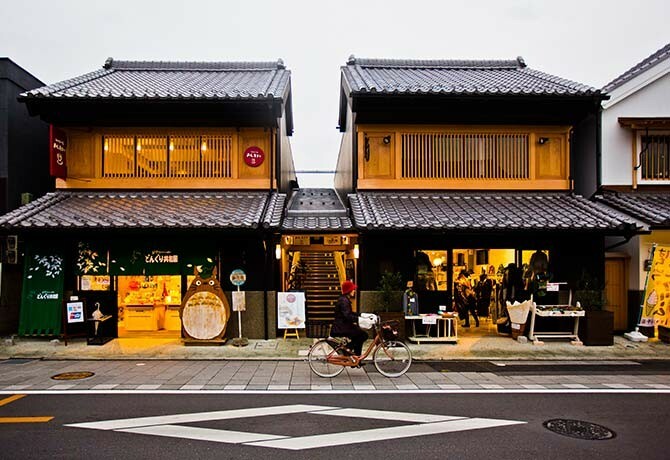 Kurazukuri Street in Kawagoe is a page out of Japan’s rich history with its Edo period architecture. At university, I knew a girl. She was born and raised in a coastal city along the sea of Japan; bubbly, always smiling and, yes, really pretty. I’d met up with her in other countries over the years but always wanted to see her hometown. Toyama is a 460km trip from Tokyo that takes the traveller past farming communities, ancient villages, fishing ports, lush forests, and across sinuous rivers, pristine lakes and the frigid Japanese Alps. 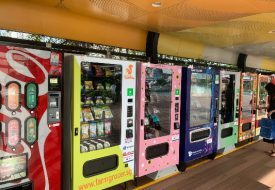 With the opening of the Hokuriku Shinkansen, travel time among Tokyo, Toyama and Kanazawa has been reduced dramatically. What was once a 4-hour trip to Toyama is now a 2-hour journey. Pushing North from Tokyo, I started my journey to Toyama via Kawagoe, Saitama. A 30-minute train ride from Tokyo, the city is known for its Edo period (1603-1867) shop fronts and the Kitain temple which purports a 1,200-year history. In 1638, a fire had ravaged through the grounds, destroying most of Kitain. During rebuilding efforts, then shogun Tokugawa Iemitsu (grandson of the first shogun, Tokugawa Ieyasu), ordered several buildings from the Edo castle, including his room, to be moved and reconstructed at Kitain temple. The temple, with its castle buildings, still stands today, as do a collection of 500 venerated statues of rakan, or enlightened beings in animated poses. Moving on, I arrived at the foot of the Japanese alps, in Chichibu. There runs the Arakawa river, where wooden rafts will take passengers to shoot rapids. The area is a verdant garden of Eden, spotlessly clean and serene. A culinary speciality here is the delicious open -charcoal-grilled Iwana fish and eel. 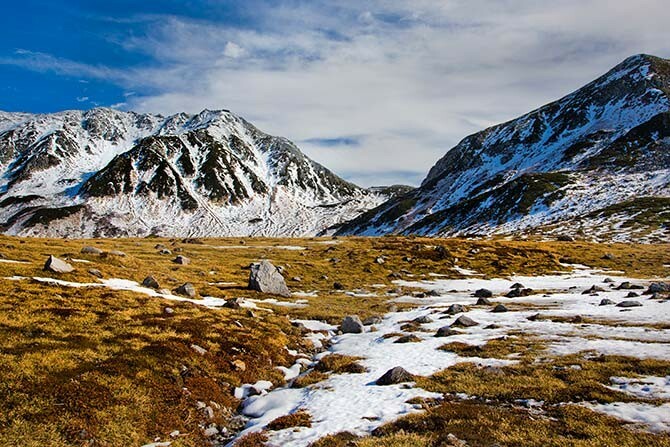 Picturesque Murodo Plateau sits at the highest point of the newly-opened Tateyama Kurobe Alpine. Cleaving the prefectures of Saitama and Toyama are the Hida Mountains, the Kiso Mountains and Akaishi Mountains. The average height of the central range rises about 3,400m. Ascending Mount Tateyama, one of the tallest peaks in the Hida mountains, along the Tateyama Kurobe Alpine Route is a visual treat. Snowmelt feeds Lake Midorigaike, a 2,500m-high tarn, as clouds hide the world below in a sea of fluffy cotton. Owing to its distance from the sea, the local delicacies here have more legs than scales. In all honesty, the molasses-coated crickets and bee larvae were not unpalatable and made great beer snacks. Down on land, Toyoma is largely agrarian. Farmsteads form a large part of the passing scenery between modest-sized towns. Deeper into the hinterland, the Shogawa river snaked its way through picturesque valleys where ferries cruise down the waterways. Gokayama Ainokura Gasshozukuri village is another timeless destination. Conferred UNESCO status, it is a collection of thatched roofed dwellings, constructed with traditional methods. 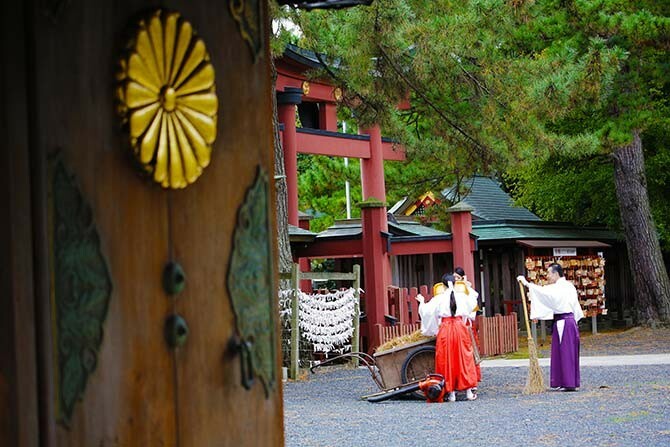 Strikingly-attired nuns in training tend to the daily chores at Kehi Shrine. At the furthest point of our travels lay Takaoka. I couldn’t help but announce my arrival to my university mate with a text message and some photos: “Ayako, I bet you are missing Takaoka from London, I love it here”. Takaoka is blessed with pristine water (certified “remarkable” by the Ministry of the Environment) from underground springs and the nearby mountains, giving the city an advantage in producing premium rice and high-quality sake. Beneath turbulent Hokusai-inspired waters off the city’s coast — late Japanese painter Katsushika Hokusai was known for producing detailed landscape images — marine life abounds. Behind, mountains rise up to create a view cherished and recognised throughout Japan as a national treasure. A stay at Takaoka is the quintessential Japanese experience — you are soused in its 400-year-old history, distinctive scenery and pampered with the sweetest sake and freshest cuisine. On the return leg, we toured Fukui city, capital of the eponymous prefecture. An exceptional destination, it hosts a dinosaur museum, craft workshops, has great seafood and the sprawling Ehi-Ji zen temple. The temple, built in the 13th century, had been beautifully preserved and now serves as the headquarters of the Soto Zen sect. With my trip to the enchanting Hokuriku region coming to a close, the big lights of the Osaka metropolis kept me busy before my flight. 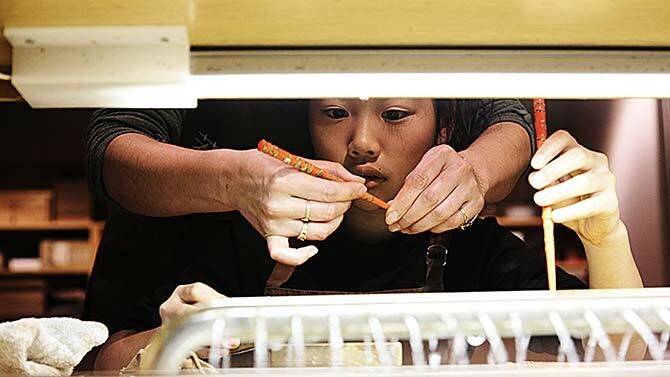 Get creative as you apply the finishing touches to your very own pair of chopsticks. Throbbing with life, the main Dotonburi area is home to a constant swirl of locals and tourists, making their way to the numerous shops, eateries and pubs. Among the hubbub, I walked over to one of the ubiquitous okonomiyaki stalls and savoured the savoury pancake generously drizzled with mayonnaise and tonkatsu (pork cutlet) sauce — a delicious reminder of my final moments in the Land of the Rising Sun. The writer’s trip was made possible by the Japan National Tourism Board.